Skid-steer loaders and compact track loaders (CTLs) always have been true workhorses in the field. As they continue to grow in popularity, equipment manufacturers are working to make these machines faster, more powerful and more efficient for landscape crews to operate. While both CTLs and skid-steers continue to be popular in the landscape industry, Jason Boerger, marketing manager for Bobcat Co., based in West Fargo, N.D., says he is seeing an increase in contractors updating or adding to their compact equipment fleets with CTLs. He says this trend is because these machines can perform better in soft, wet or sandy ground conditions. Boerger says skid-steer and CTL manufacturers are placing more focus on torsion axle suspension systems and self-tensioning track technology. Last year, Bobcat introduced a five-link torsion suspension undercarriage on its M2-Series T870 CTL. The new undercarriage provides increased durability with a 15 percent increase in diameter to the drive shaft inside the gearbox, and a continuously lubricated outer bearing in the drive motor. An additional fifth link on the rear axle stabilizes the undercarriage to increase machine stability and performance when grading and provides enhanced ride quality for operators. The five-link torsion suspension undercarriage also features an automatic hydraulic track tensioning system. Girard agrees that manufacturers are focused on improving productivity and performance. Case increased the rated operating capacity of its SV340 skid-steer by 400 pounds compared to the previous model, while keeping the same size footprint by designing a more robust lift-arm, H-link and upper chassis. The company also made improvements to the manifold valves, gear pumps and the auxiliary loader circuit for added power and performance. Case also recently introduced the TV370 CTL, which Girard says is suited for applications that call for lift capacity and strength but may not require higher horsepower to run high-volume production attachments. Brandon Barker, commercial operations manager for J. Barker Landscaping in Bedford, Ohio, has a fleet of four skid-steers that he uses year-round for tasks such as hauling material, moving trees and removing snow. Because the machines are used so frequently for snow removal during the harsh Ohio winters, Barker says his company prefers skid-steers over CTLs because they perform better in the snow. The company purchases, rather than leases, its skid-steers and keeps them for five or six years depending on the level of wear and tear they experience. The machines used frequently for snow removal are replaced sooner because of damage caused by salt and extreme weather conditions. Barker says the company will sometimes rent skid-steers for snow removal to prolong the lives of the machines it owns. J. Barker Landscaping provides 40 percent design/build, 25 percent maintenance, 20 percent snow removal, 10 percent demolition and 5 percent dumpster services to a 60 percent residential, 40 percent commercial clientele. Over the years, Barker says he has noticed several new features that have made skid-steers more functional and efficient. For example, backup cameras are useful when working in tight areas or when operators are working alone and don’t have someone to guide them. 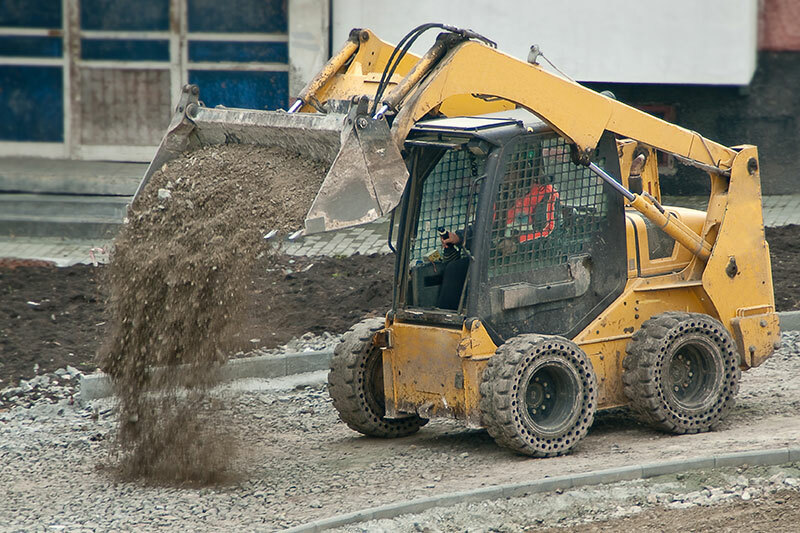 Keyless start systems make the machines much less prone to theft, especially those that are left on job sites. Barker creates a custom pass code to start the machine, eliminating the need for a key. Barker says skid-steers have also become faster and more powerful, which increases productivity on the job site. His crews are able to do more work with fewer people in less time. Attachments are another way Barker’s crews increase productivity with skid-steers. They regularly use a bucket, a forklift and a harley rake but will also rent other attachments when needed for specific jobs. Boerger agrees that adding attachments increases a machine’s versatility, providing contractors the opportunity to offer additional services. When purchasing skid-steers, Barker first determines the primary use of the machine. He then says the most important factor to consider is whether his operators, who will be the ones using it on a daily basis, like how the machine performs. Barker works with his dealers to test several different skid-steers on actual job sites to see how they handle and operate before selecting one. He urges contractors to try out different brands because some manufacturers provide better machines depending on the application.